all aspects of the employee life cycle. Click our video on the left to learn more! a customized retirement plan that works for you! so you can make the best decisions on risk transfer and assumption. Penalties started accruing January 1, 2015! ACA IRS forms are now final. Are you prepared? Outsourcing has moved from an occasional experience to an efficient way to manage a business. The Benefit Companies, Inc. has combined technical abilities, consultative experts, and a vast array of products and services to customize a solution to suit your outsourcing needs. 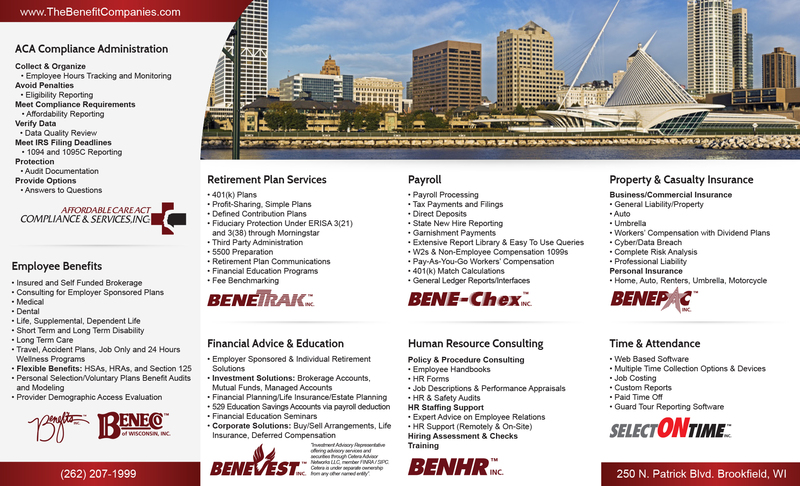 We provide employee benefits, retirement plan services, financial planning and education, property and casualty insurance, human resource consulting, time and attendance, payroll, and Affordable Care Act administration services. We pride ourselves in providing flexible, reliable, and outstanding customer service. Contact us today to see how we can help you! Our educational webinars keeps you informed, prepared, and up to date on Affordable Care Act Administration & Compliance and Employee Benefit Best Practices. The healthcare system in our country is constantly changing. Stay current and remain compliant with these important updates regarding the Affordable Care Act. Our BeneToons offer a fun way to keep yourself educated and up-to-date. We cover numerous topics in relation to the services we offer; they are short, sweet, and to the point.